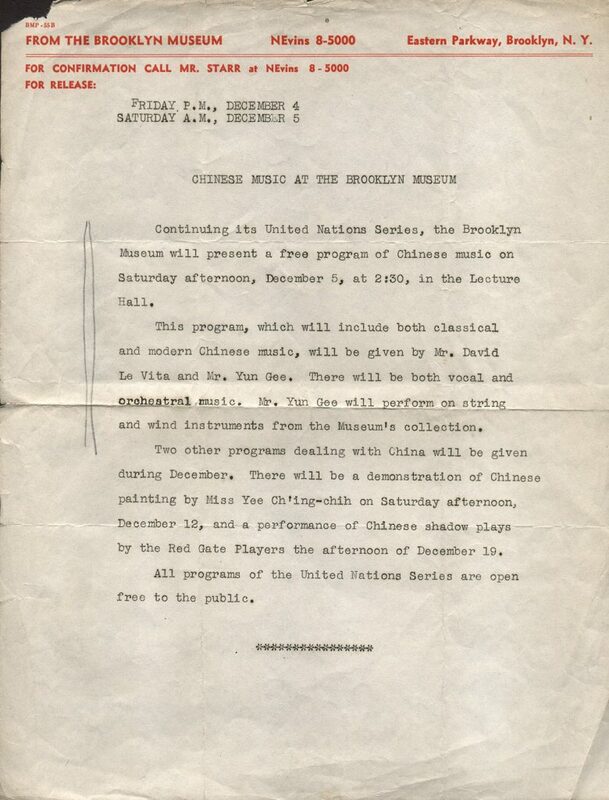 Continuing its United Nations Series, the Brooklyn Museum will present a free program of Chinese music on Saturday afternoon, December 5, at 2:30, in the Lecture Hall. This program, which will include both classical and modern Chinese music, will be given by Mr. David Le Vita and Mr. Yun Gee. There will be both vocal and orchestral music. Mr. Yun Gee will perform on string and wind instruments from the Museum’s collection. Two other programs dealing with China will be given during December. There will be a demonstration of Chinese painting by Miss Yee Ch’ing-chih on Saturday afternoon, December 12, and a performance of Chinese shadow plays by the Red Gate Players the afternoon of December 19. All programs of the United Nations Series are open free to the public.